Walter Joseph "Wally" Hickel (August 18, 1919 – May 7, 2010) was an American businessman, real estate developer, and politician. Starting out in Alaska during territorial days as a construction worker and subsequently a construction company owner/operator, he later became heavily involved with real estate development during Alaska's post-World War II boom period, building residential subdivisions at first, then branching out to building and operating shopping centers and hotels. Thrust into politics during the early 1950s by a power struggle within the territorial Republican Party and the battle to achieve statehood for Alaska, Hickel remained a formidable power in Alaskan politics for nearly a half century. Hickel served as the second governor of Alaska. Defeating incumbent and first governor William A. Egan in 1966, he served as governor until 1969, ending with his resignation upon his confirmation in the position of United States Secretary of the Interior in the cabinet of President Richard Nixon. He later served a full term as governor from 1990 to 1994 under the banner of the Alaskan Independence Party, thus far the party's most significant electoral achievement. Born in Ellinwood, Kansas in 1919, he grew up on his parents' Dust Bowl tenant farm during the Great Depression near Claflin, Kansas. Hickel relocated to Alaska in 1940, going into the local real estate industry. By 1947, Hickel had formed a successful construction company. While some fellow Republicans in the Alaska Territory opposed statehood, Hickel joined Democrats in calls for joining the Union during the late 1940s and into the 1950s. Using his growing popularity among Alaskan Republicans and growing political clout in Washington, Hickel was able to travel to the nation's capital to engage in talks with key Republicans in both the U.S. Congress and within the Eisenhower Administration to speak about Alaskan statehood. Thanks in part to his efforts, Hickel's debates with Congressional leaders led to enough initially hesitant Republicans voting in favor of the Alaska Statehood Act in 1958. Hickel was elected as Alaska's second governor in the 1966 state general elections, defeating his Democratic rival and incumbent governor William A. Egan. Hickel's first governorship, the second in the young state's history as well as Alaska's first Republican governorship, oversaw the discovery of oilfields at Prudhoe Bay in 1968, a factor that would prove politically decisive in later years. Hickel, a moderate Republican and environmentalist, did not push for heavy oil exploitation. In 1968, Hickel appointed Ted Stevens to the United States Senate to replace the recently deceased Bob Bartlett. Like his predecessor Egan, Hickel sought to improve relations with Alaskan Natives in seeking resolutions on Native land claims. A group of Native Americans from Interior Alaska, including Morris Thompson and Don and Jules Wright, played major roles in his 1966 campaign and subsequent governorship. 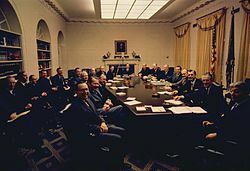 The Nixon cabinet poses for a photograph, days after Nixon's inauguration as president. Hickel is slightly left of center. Richard Nixon's election as U.S. President in late 1968 led to an offer to Hickel from the President-elect to serve in the United States Cabinet as Interior Secretary. Initially, Hickel declined the cabinet offer. Nixon replied that his decision was final. Hickel would recall years later that he cried afterward and announced that he would be resigning from the governorship to go to Washington. Hickel's nomination was met with what he later wrote was a newspaper "smear" campaign of false and "crazy accusations" that he had a corrupt and anti-environmentalist record as governor. Opposition to his nomination was led by influential columnists Drew Pearson and Jack Anderson. Newspapers opposing his nomination included the New York Times and the Los Angeles Times. In the Senate, his confirmation was opposed by, among others, Democratic senators Walter Mondale and George McGovern. Sierra Club director David Brower testified in opposition to Hickel. The Senate nevertheless confirmed his nomination on 23 January 1969. Upon becoming the federal Secretary of the Interior, Hickel proved to be a strong environmentalist, supporting strong legislation that put liabilities on oil companies operating offshore oil rigs as well as demanding environmental safeguards on Alaska's growing oil industry. Hickel's centrist voice inside the Nixon Administration eventually led to confrontations with the President. In 1970 following the shooting of college students at Kent State University by the Ohio National Guard, Hickel wrote a letter critical of Nixon's Vietnam War policy and urging him to give more respect to the views of young people critical of the war, writing in part, "I believe this administration finds itself today embracing a philosophy which appears to lack appropriate concern for the attitude of a great mass of Americans – our young people." That dissent garnered worldwide media attention, and on November 25, 1970, Hickel was fired over the letter. Days before he lost the office, Hickel had told CBS' 60 Minutes that he would not quit under pressure and that he would go away only "with an arrow in my heart, not a bullet in my back." Hickel's undersecretaries, such as Leslie Glasgow, who was in charge of Fish, Wildlife, Parks, and Marine Resources, were also dismissed. After less than two years in Washington, Glasgow returned to Louisiana State University in Baton Rouge, where he was a professor with expertise in the study of wildlife in the marshes. A blanket primary held on August 28, 1990 resulted in Arliss Sturgulewski, a member of the Alaska Senate from Anchorage since 1979, winning the Republican nomination for governor of Alaska. Winning the Democratic nomination was Tony Knowles, the immediate past mayor of Anchorage. The Republicans chose as their nominee for lieutenant governor Jack Coghill, a fellow state senator from Nenana. Coghill had held elected office continuously since 1957 with the exception of relinquishing the mayorship of Nenana for approximately two years, when the 1967 flood forced him to move from the city limits temporarily. Coghill had also briefly worked as a special assistant to Hickel during his first governorship. Sturgulewski, who won the Republican nomination for the second consecutive time against mostly conservative opposition, was criticized by many Republicans for her positions on issues such as abortion and capital punishment. Following a contentious meeting between Sturgulewski and prominent conservative Republicans held in the home of David Cuddy, Coghill felt that it was impossible to continue to run on the ticket with Sturgulewski. After Coghill met first with Hickel and then with Edgar Paul Boyko, the idea was hatched to run a slate of Hickel and Coghill under the Alaskan Independence Party banner. AIP chairman Joe Vogler was brought from Fairbanks to Anchorage immediately prior to the deadline for political parties to substitute their nominees. John Lindauer and Jerry Ward, who had been chosen in the primary as the AIP ticket (and would, eight years later, win another blanket primary as the Republican Party's nominees for governor and lieutenant governor), stepped aside, largely alluding to the illness of Lindauer's wife as the reason. Hickel and Coghill prevailed in the general election. Although he had common ground with the Alaskan Independence Party in fighting restrictions on land use imposed by federal environmentalism, Hickel had been one of the most influential historical proponents of Alaska statehood and never endorsed the AIP's secessionism, prompting some party faithful to petition for his recall. He rejoined the Republican Party in April 1994, near the end of his term. Hickel wanted to build a water pipeline from Alaska to California in 1991. The Hotel Captain Cook in December 2008, looking westerly from the corner of Fifth Avenue and I Street. Hickel's office was located on the second floor, immediately to the right of the camera position. Hickel was also a real estate developer and chairman of Hickel Investment Company. Most of his ventures from the 1950s onward were in building and operating hotels and shopping centers. Hickel's company built the structures in which Safeway placed most of its initial Alaska stores. Following the 1964 Alaska earthquake, Hickel, as a show of confidence in Anchorage's future, built a highrise luxury hotel on the western side of downtown Anchorage, very near one of the largest of the landslides, which befell portions of Anchorage. Hickel chose the site to prove wrong detractors, who believed that the area could not be redeveloped to a great extent. The nine-story Hotel Captain Cook opened in 1965 on Fourth Avenue, next door to the historic Wendler Building. A fifteen-story tower followed in 1972, with an eighteen-story tower in 1978. The hotel currently covers almost an entire city block, with a connected parking garage covering another half-block. 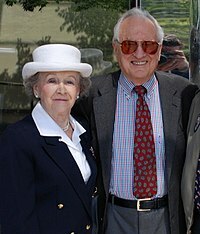 Wally Hickel and his wife, Ermalee Hickel, outside the Egan Center in Anchorage in 2008. In 2006 he supported Sarah Palin in her bid to become governor of Alaska; however, in 2009, he stated that he didn't "give a damn what she does". In 2008, he called for the resignation of U.S. Senator Ted Stevens, whom he had appointed to the Senate in 1968. His statement was made in light of the August 2008 federal indictment of Stevens related to the alleged receipt of improper gifts from Bill Allen, CEO of the VECO Corporation, an Alaskan construction company heavily involved in the Alaskan oil industry. Stevens was found guilty by a Washington D.C. jury of seven felonies in October 2008, narrowly losing his November election to Democrat Mark Begich, eight days later. Stevens' conviction was later set aside by the federal trial judge over the issue of prosecutorial misconduct. The Justice Department under Eric Holder declined to refile charges against the ex-Senator. Hickel died on May 7, 2010, in Anchorage, Alaska. In keeping with his often-stated wish, he was buried standing up, facing east towards Washington, D.C.
^ Walter J. Hickel, Who Owns America?, New York: Paperback Library, 1971, p.13. ^ Walter J. Hickel, Who Owns America?, New York: Paperback Library, 1971, p.25, 31. ^ New York Times (editorial), "The Hickel nomination", 22 January 1969. ^ Walter J. Hickel, Who Owns America?, New York: Paperback Library, 1971, p. 22–41. ^ a b "TOPICS OF THE TIMES; Wally Redux". New York Times. 1990-11-08. Retrieved 2008-09-05. ^ "Leslie L. Glasgow". lsuagcdenter.com. Retrieved 2014-10-21. ^ "The 1990 Elections: State By State; West". New York Times. 1990-11-07. Retrieved 2008-09-05. ^ "Two in the House Advance In Drive for Senator's Seat". New York Times. 1994-08-25. Retrieved 2016-03-20. ^ Reinhold, Robert (1991-08-15). "Alaska Offers Californians An Additional Water Spigot". California; Alaska: NYTimes.com. Retrieved 2016-01-29. ^ "Former Alaska Gov. Hickel dead at 90". Alaska Dispatch. May 7, 2010. Archived from the original on July 19, 2012. Hickel, Walter J. (1971). Who Owns America?. Englewood Cliffs: Prentice-Hall. ISBN 013958322X. 328 pp. Roberts, Malcolm B., ed. (1990). Going Up In Flames. (Hickel with numerous collaborators including Robert B. Atwood, Irene Ryan and Mead Treadwell; authorship credited to the Commonwealth North Federal-State Relations Committee). Anchorage: Alaska Pacific University Press for Commonwealth North. ISBN 0-935094-15-6. 132 pp. Roberts, Malcolm B., ed. (1994). The Wit and Wisdom of Wally Hickel. Anchorage: Searchers Press. ISBN 0-9644316-0-2. 239 pp. Hickel, Walter J. (2002). Crisis in the Commons: The Alaska Solution. Oakland/Anchorage: Institute for Contemporary Studies in association with the Institute of the North. ISBN 1-55815-521-X. 290 pp. Wikimedia Commons has media related to Walter Joseph Hickel.